The City of Life is the perfect place to witness one of the world's busiest and most impressive natural harbours, Victoria Harbour. Hong Kong's striking coastline, and the countless container vessels, junks, sampans and pleasure craft gliding around the harbour afford an exciting view. The spectacular backdrop of Hong Kong Island's stunning skyline will fire your imagination as darkness falls and the city's dazzling neon cityscape emerges. Cruises set sail from piers on either side of Victoria Harbour, usually at Central District's Queen's Pier (near the Star Ferry Concourse) and Tsim Sha Tsui's Kowloon Public Pier (adjacent to the Clock Tower). Renowned as one of the world's most sophisticated cities, Hong Kong is also a rural wonderland where myths and legends inhabit mountain peaks, hilltop outcroppings and misty waterfalls. Explore it by day and embrace all it has to offer. Hong Kong Island boasts award-winning architecture and superb harbour views. Victoria Harbour is the perfect vantage point from which to view the city. 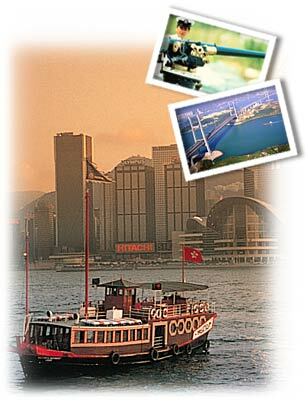 Kowloon Peninsula possesses some of the most interesting streets and cityscapes in Asia. In the New Territories, rural areas and country parks are spread across massive mountain ranges, lush valleys and grassy hills. 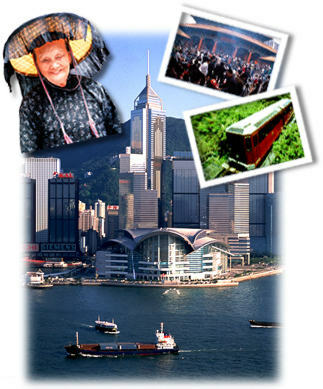 Explore the rural hamlets and scenic harbours of the Outlying Islands like Lantau and Cheung Chau. The City of Life never sleeps. 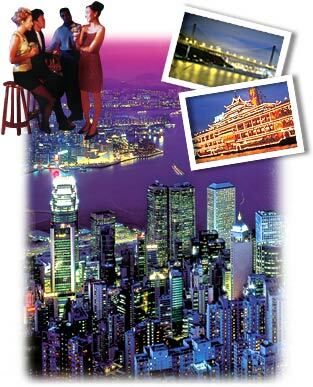 Hong Kong, an energetic city at all hours, is the perfect place to experience an evening tour. Experience the very best of nightlife with a romantic harbour cruise, a magnificent view of the glittering city or a feast at one of Hong Kong's notable seafood destinations. Whether you're after a leisurely evening's entertainment in a cosy revolving restaurant on top of one of the tallest buildings in Hong Kong or set to hit the town, you'll be able to find a tour to satisfy your every desire. Take advantage of Hong Kong's prime location amidst unique and diverse neighbouring cities in the Pearl River Delta of China. Whisk off to the Mediterranean enclave of Macau, famous for its historical monuments, glamorous casinos and exquisite Portuguese/Chinese cuisine. See everything from a local free trading market to theme parks to museums in the bustling Special Economic Zone of Shenzhen. Or capture a bit of Chinese history in Guangzhou by visiting the Dr Sun Yat-sen Memorial Hall and the Chen Clan's Ancestral Hall. With convenient and comfortable means of transportation such as trains and ferries, an enriching experience is never far away! 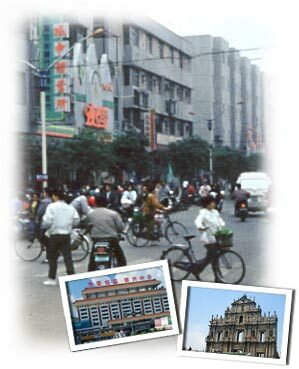 Visas are required for all foreigners entering mainland China. Visitors can book tours to neighbourity cities from the hotel tour desks or concierge. Tours booked this way will include group visa.